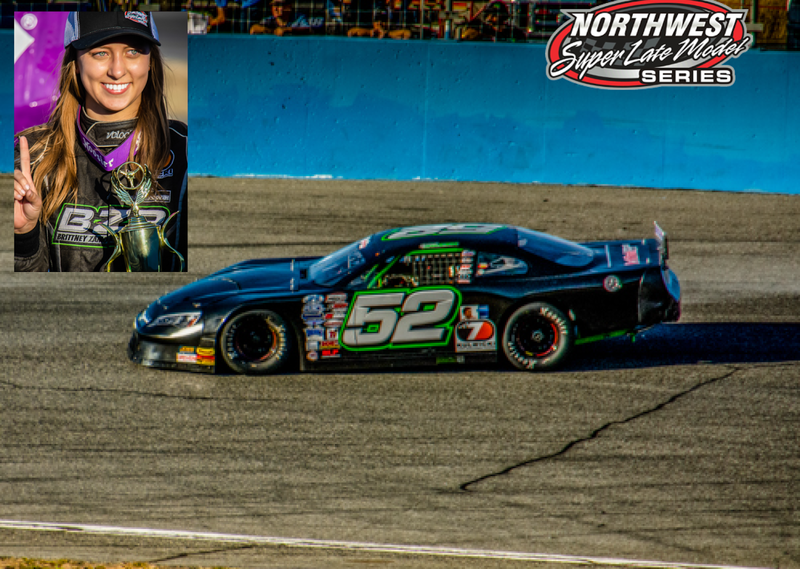 Rochester, WA (August 18, 2018) “Super Girl” Brittney Zamora wowed fans at Wenatchee Valley Super Oval (WVSO) for the Knutson Construction Fall Shin-dig Neal Newberry 125 when she passed northwest legend, Garrett Evans (Wenatchee, WA) to take over the lead and charge to victory in the fifth running of the feature event honoring Neal Newberry. Zamora, who reverted to her trademark green car graphics for the event, merely had to take the initial green flag to secure the championship. Being the first to cross the checkered flag made it even sweeter. Zamora is the defending Neal Newberry 125 and Northwest Super Late Model Series (NWSLMS) champion. This is her second win of the 2018 season. A tight pack made up the field and the race itself was intense. Excited fans saw successful three-wide racing on more than one occasion during the event giving credit to the professionalism of the touring drivers. Starting third in the field behind quick qualifier, Gracin Raz (Lake Oswego, OR), Zamora quickly moved into the second position. With the tight field, several cautions flew during the 125-lap feature event. Zamora restarted outside of Raz on several occasions and was content to fall in line behind him once they crossed the green flag. Raz developed a flat tire on one such restart, causing Zamora to check up, allowing both Garrett and Jan Evans (Wenatchee, WA) to pass. Zamora was able to retake the younger Evans quickly. The wily veteran proved to be a bigger challenge, as he was able keep Zamora behind him. Zamora waited for the right opportunity and when she got it, nabbed the lead and the took the final fifty-five laps to the checkered. In addition to full-time school and a part-time job, Zamora has run a full-time schedule at Evergreen Speedway, earning a fifth place overall and rookie of the year honors. If that and the touring championship wasn’t enough, Zamora made time for the Boys and Girls Club, and collected money and supplies to put nearly 100 back packs full of school supplies for area children. The icing on the cake was a 3-race deal with High Point Racing and Toyota Racing Development, in which Zamora finished well in the first two events. Running a limited schedule over the past couple years, Raz showed he still has what it takes to put himself in position to win. Laying down the quickest lap in qualifying and capturing the win in his positioning heat race labeled Raz a threat to win. Raz fell from first to seventeenth with the flat but was able to hang on until a caution flew. Losing valuable track position with the flat, Raz was able to make a comeback to fifth. Alan Cress (Stayton, OR) who ran a limited schedule in 2018, qualified second on the grid. Cress won his positioning heat race and started outside front row next to Raz. Cress never strayed far from the top to earn his second podium finish of the year, including a win at South Sound Speedway. Mitch Kleyn (Quincy, WA), the lone veteran of the series made some impressive moves on his way to a fourth-place finish. Starting seventh on the grid, Kleyn worked his way to the front and made an outside challenge for the lead. Evans and Zamora were able to shuffle Kleyn back to fourth where he finished. Kleyn and the Wild 1 Team secured a third runner-up finish in the series championship standings. The point’s battle coming into the race was tight between Kleyn, Andy Sole (San Tan, AZ) and Trenton Moriarity (Monroe, WA). It came down to the checkered flag to determine the final order with Moriarity finishing 7th and Sole finishing 10th respectively in the feature event. Moriarity finished third in the championship standings and was crowned the NWSLMS Rookie of the Year. The NWSLMS will be back in 2019. Stay tuned for more information. For more information, you can follow series Facebook page or website www.nwsuperlatemodels.com. Auto Meter Gift Certificate – Buck Noel Jr.